The Department of Economics and Social Sciences welcomed Dr. Vittorio Larocca from Luiss Guido Carli who presented a theoretical model in which financial intermediaries strategically compete by offering different types of financial services, on February 27, 2019. The Department of Economics and Social Sciences hosted Dr. Walter Ferrarese (University of Rome Tor Vergata) who presented his research titled “Equilibrium Effort in Games with Homogeneous Production Functions and Homogeneous Valuation”, on Wednesday, February 13. The Department of Economics and Social Sciences organized a presentation by Bright Ikhenaode, PhD candidate in Economics from Sapienza University in Rome, titled "Immigration, Skill Acquisition and Fiscal Redistribution in a Search-Equilibrium Model" on Wednesday, January 30. JCU welcomed Dr. Francesca Dominici, Professor of Biostatistics, Population and Data Science at the Harvard T.H. Chan School of Public Health, Co-Director of the Harvard Data Science Initiative for a conversation with Visiting Professor Deanna Lee on The Revolutionary Role of Data Science, on 16 January. The Department of Economics and Social Sciences organized a talk by JCU Professor Adrian Stoian titled "Data: the New Oil", on Tuesday, November 27. JCU Associate Professor of Psychology, Bruno Galantucci, was invited to speak at two international scientific conferences. On October 19, he spoke at the 7th Peripatetic Conference in Poland, while on October 31, he spoke at the "Interrelations Among Different Forms of Human Communication" workshop in Sweden. The 2018 Nobel prize in Economics went to two U.S. economists: Professor William Nordhaus (Yale University) and Professor Paul Romer (University of Chicago). Both economists were honored for their research on specific factors that generate sustainable long-term economic growth and wealth. Omar Attiya, class of 2018, graduated with a double degree in Economics and Finance and in Marketing. Born and raised in Kuwait, he is the fourth member of his family to graduate from JCU, following his two older brothers and mother. While at JCU, he worked as a Student Assistant at the IT Office and as a representative for the Admissions Office. 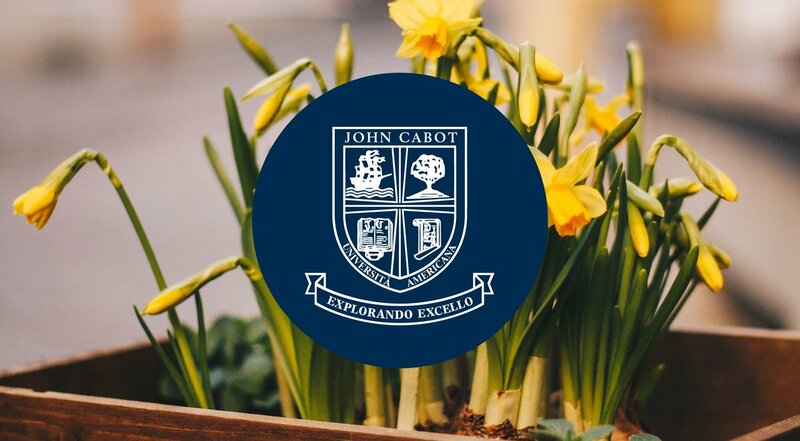 John Cabot University’s Vice President and Dean of Academic Affairs Mary Merva is pleased to announce the Valedictorian for the Class of 2018, Flavio Garinei. The Department of Economics and Social Sciences presented the lecture “Mapping the Megalopolis - Security and Solidarity on Mexico City's Periphery” on March 19th. The guest speakers were Jennifer L. Johnson, Associate Professor of Sociology at Kenyon College, and Shannan N. Mattiace, Professor of Political Science and International Studies at Allegheny College. On October 5, 2017 JCU students enrolled in the Managerial Economics class attended a Pitch Your Failure presentation organized by Ashoka ChangemakerXchange at the TIM #Wcap Accelerator in Trastevere. Former JCU Professor Pal Belenyesi and JCU alumna Zina Abuhaydar recently published an article in the journal Society and Economy.